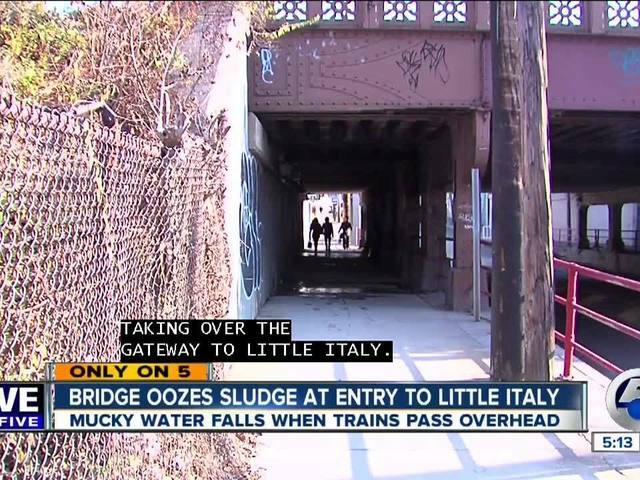 University Circle Inc. and the Little Italy Redevelopment Corp. are calling for solutions to the long-term “sludgy” problem posing a hazard for drivers and pedestrians at the Mayfield Road bridge underpass. Mucky water appears to be leaking from the railroad bridge above, dropping on residents and causing slippery puddles on the ground below. While the sidewalk is owned by the city, the bridge is part of a collection railroad bridges in the neighborhood owned by CSX and Norfolk Southern. “A barrier between our two neighborhoods is most definitely this bridge,” Chris Ronayne, President of University Circle, Inc. told newsnet5.com. University Circle, Inc. and the Little Italy Redevelopment Corp. have received many complaints from residents, who are slipping in puddles or crossing the street to avoid the mud. LIRC Executive Director Ray Kristosik told newsnet5.com that the opening of a brand new RTA station at the end of the underpass has only exacerbated the pedestrian safety issues. “You put $10 million into a new station on the other end and it’s hard to get to, it’s not a pleasant experience,” Kristosik said. Ronayne and Kristosik said they’ve also received reports of spalling concrete and other materials falling from the bridge onto pedestrians and drivers below. “What comes from above is sludge, loose rock material, spalling concrete and it’s all causing problems,” Ronayne said. Cleveland State Engineer Norbert Delatte reviewed newsnet5.com’s footage of the leaks and eroding concrete. While Delatte said that water leaks are not a hazard by themselves, they could lead to deterioration of concrete and steel. The RTA told newsnet5.com that is has been in contact with both neighborhood groups. The RTA proposed a plan to fix drainage and lighting concerns but CSX has yet to sign off. A CSX spokesperson told newsnet5.com in a statement that the company has received the proposal but is still in the process of a “detailed review.” “CSX has been engaged in discussions with the RTA about improvement projects for several bridges in Cleveland, including the bridge that crosses Mayfield Road. RTA has submitted a plan that includes aesthetic improvements as well as potential physical attachments to the bridge, which requires detailed review to ensure that the proposed attachments do not interfere with CSX’s bridge maintenance or inspection processes. That review is nearly complete and we anticipate being able to respond to RTA in the near future. Ronayne said University Circle Inc. has made attempts to contact CSX but their inquiries have not been returned. “We just want a hearing and we want a fix. We want them to participate financially in a permanent fix that bridges neighborhoods and doesn’t divide them,” Ronayne said. newsnet5.com also reached out to Norfolk Southern. A spokesman said he could not speak to any specific conversations the company has had with neighborhood leaders. We have almost 10,000 bridges in our network; 1,280 of them are in Ohio. They are inspected at least once annually to make sure they can safely handle train traffic loads so we can continue to be the lifeblood of economies like the one in Cleveland. We spend more than $2 billion annually on our network, and the largest portion of that budget is on track and infrastructure like bridges. We have plenty of business incentive to make sure our bridges are safe, and there’s plenty of personal incentive since our train, track and signal crews use those bridges every day. Ronayne and Kristosik said their organizations are working on having the sludge tested for toxicity levels.